'Pierrot-Ferdinand reads a paperback edition of Elie Faure's Histoire de l'Art and frequents works of art in the form of postcards that can be pinned to the wall. His experience is that of the ordinary twentieth-century man who accedes to art through commentary and reproductions' (Kaleidoscope p.85). 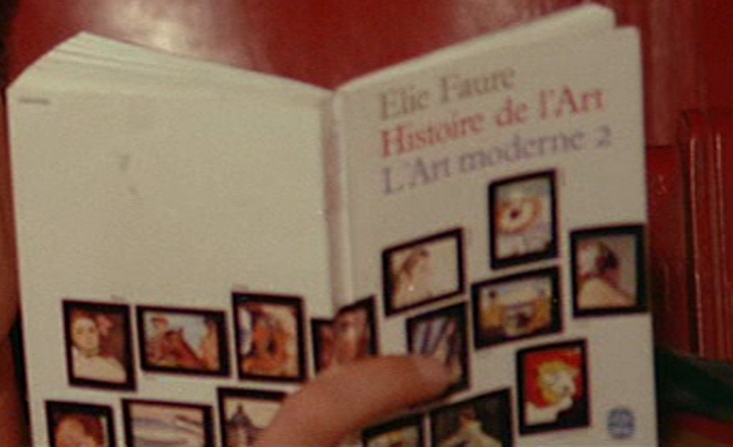 As well as the vignettes on the covers of the two volumes of Faure, above, paintings from the history of art appear in Pierrot le fou in four different ways. That Jacqueline's eye is turned upside down might be abstractly 'point of view' (Ferdinand's altered view as he is manhandled by a gangster), but it remains, I think, a narrational insert. 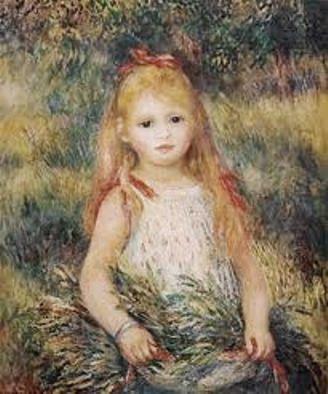 The opening identification of Marianne and Renoir's little girl with a wheatsheaf in her lap is at the close an identification with a grown woman, also carrying a wheatsheaf. This, below, is a supplemented version of a text I wrote for a 2010 blu-ray edition of Pierrot le fou. A black screen, constellated with red letters, all A; then are added a B, a C, and some Ds, by which point we see an arrangement in lines. Then seven Es, two of which are blue, on their own line. The laying out of the alphabet continues in order, and the first recognisable words to appear are FILM, then JEAN and ANNA, telling us this is a page of credits, which will end up reading: ‘JEAN PAUL BELMONDO ET ANNA KARINA DANS PIERROT LE FOU UN FILM DE JEAN LUC GODARD’. The title of the film is in blue, the rest in red. At once all but the title disappears, to itself then go in stages, first becoming ‘PIERROT FOU’, then ‘O O’, then just a single blue ‘O’, off centre. I describe at such length the title sequence of Pierrot le fou firstly because it is one of the finest examples of Godard’s work as the greatest creator of title sequences in French cinema, and secondly because it represents a key dynamic at work in the film as a whole. There is the idea of order, the alphabet, the arrangement in lines, the choice of colours; and then there is the loss of order, of coherence, reducing the signs to a simple, tragic O. 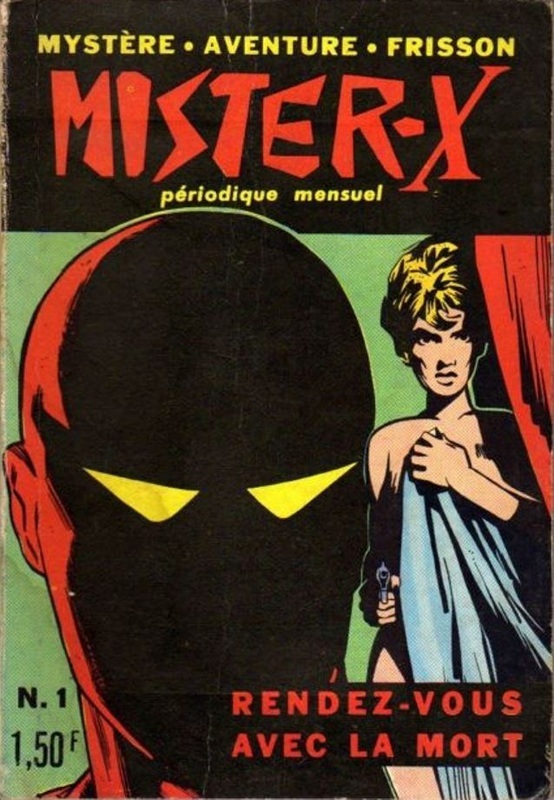 In the film, there is order in the plot, a straightforward noir-style thriller, and there is disorder in the insertion of extraneous material: paintings, posters, book covers, cartoon drawings, neon signs; documentary-style interviews, dramatic vignettes, comic cameos, musical comedy numbers. 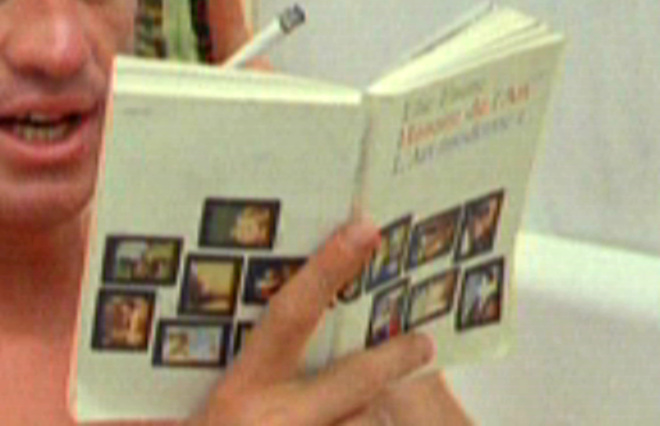 There is order in the film’s return to the red and blue of the title sequence, when we see Marianne (Anna Karina) in close up in front of a French tricolour, and are reminded that her name is that of an emblem of France, that the film’s story begins on the 14th of July, Bastille Day, and that this is a journey of discovery through France, from North to South, from city to sea. 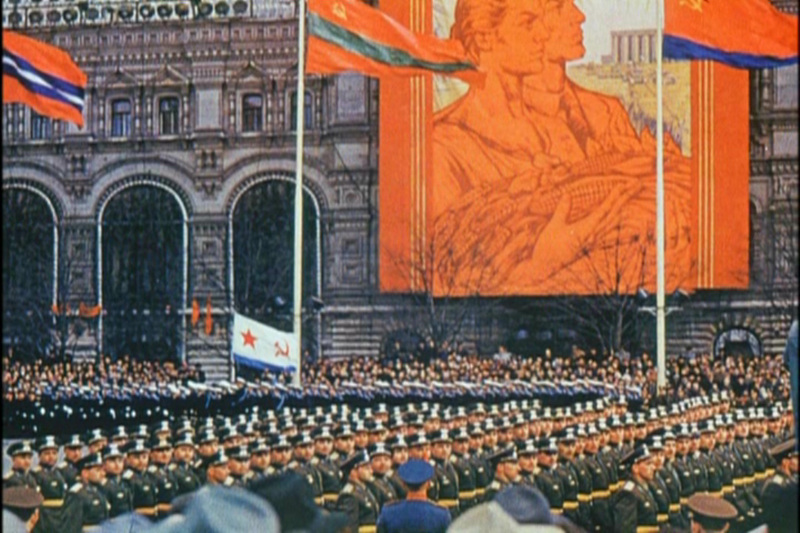 These simple signs are repeated throughout the film by all the blue and red clothing, furniture, cars and books, but the symbolic colour scheme is complicated by striking patches of yellows, oranges and greens (see Ferdinand’s parrot), and by the subtler colourings of the landscapes. The French flag’s colours become part of a broader palette. 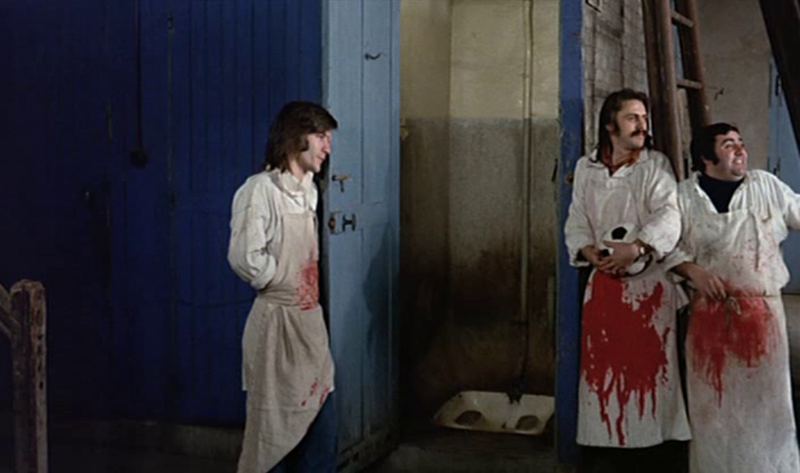 In this, Pierrot is more subtle than in a later ‘state of France’ film, Tout va bien (1972), where the blues, whites and reds are always the French flag, or indeed subtler than those late ‘60s films that engage with left politics, where the colour red is one of two things: communism or blood. And so on, up to ‘the tenth Godard film with Coutard’. There is playfulness in this enumeration (Belmondo had made at least seven films that he would have thought of as serious), but it was Godard’s fifth in Scope (counting two contributions to sketch films), his sixth with Anna Karina and tenth with cinematographer Raoul Coutard (not counting the sketch films). He could have added that this was his third film in colour, after the musical comedy Une femme est une femme (1961) and the epical tragedy Le Mépris (1963), both films with which Pierrot has affinities. Like Le Mépris, Pierrot is a landscape film, contemplating human suffering against a Mediterranean backdrop. Pierrot reunites Karina and Belmondo from Une femme est une femme, this time in tragic rather than comic mode, so that here Karina’s character really is not just ‘une femme’, but ‘infâme’ [despicable’]. According to Godard, in Pierrot le fou he was actually remaking A bout de souffle. He had Belmondo again, in thrall to a treacherous woman. He recycles fragments of dialogue from the earlier film, and returns to that film’s obsession with things American. 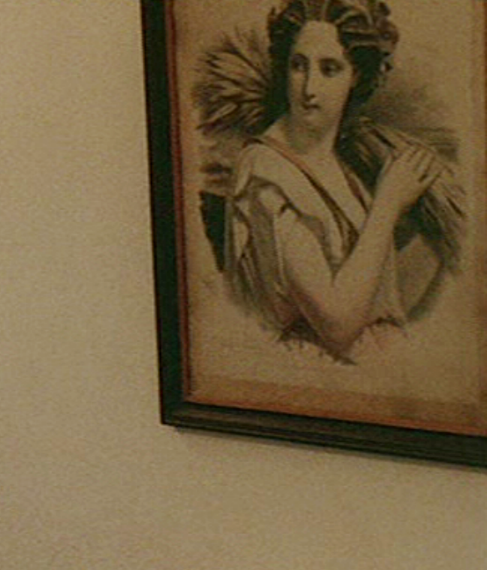 But Pierrot le fou is not just a recycling of earlier motifs, and not just one more item in a list. Especially when compared with A bout de souffle, Pierrot is radically new. Something had already begun to happen in Godard’s films, a movement away from narrative to essay forms (see Une femme mariée), and this movement is continued in Pierrot when, in the journal he keeps, Ferdinand begins to philosophise. Godard’s cinema was moving from fiction to documentary, signalled in Pierrot when the film turns briefly into Jean Rouch-like cinéma-vérité, announcing the sociological manner of Godard’s next film, Masculin Féminin. 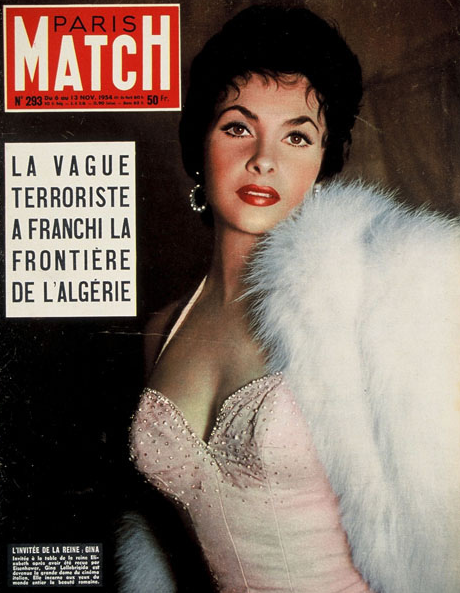 The past of Algeria is opposed to the present of Vietnam, a former French possession where the colonial baton has passed to the Americans. The USA is a modern expression of violence, but the violence of Marianne in the film, representing France, is a reminder that France is no more innocent. But again this simple situation is complicated, this time by Frenchness, and poetry: the director of Forty Guns, of Shock Corridor, of Underworld USA is, astonishingly, in Paris to make a film from a book of lyric poetry, Baudelaire’s Les Fleurs du Mal. This points, tentatively, to something else that is new in Pierrot, a lyricism associated with poetry and landscape. The lovers on the run move from Paris down towards the Mediterranean, discovering a wilderness in the heart of France, accompanied by fragments of poetry. This lyric impulse is summed up in the lines from Rimbaud that close the film, as we contemplate the sea and sky: ‘Eternity. It’s just the sea. And the sun.’ When we saw something similar in Le Mépris, it was framed and qualified as the film within the film, as an ironic counterpoint. Here, and in the landscape films of Godard’s mid to late period (Sauve qui peut, Passion, Prénom Carmen, Je vous salue Marie, King Lear, Nouvelle vague, Hélas pour moi), the poetry of landscape becomes a value in itself, the essence of the film, while the story is, almost, just a contingency. In Pierrot the story is in conflict with the landscape, disturbing an elemental beauty (composed of earth, water, sky and sun) by speeding through in red and blue cars and splattering fake blood everywhere, interrupting silence or the lyrical slow theme of Duhamel’s score with the noise of engines and guns and pop music. But the story does have its importance: Godard remained relatively faithful to the outline of the crime novel he adapted, Lionel White’s Obsession, losing only the difference of age between the lovers. Despite his claim that this is ‘the first film noir in colour’, Pierrot fits well in a developing French tradition of noirish colour films, usually adapted from American crime fiction. Chabrol’s A double tour (1959), also with Belmondo, initiated the ‘murder under the sun’ motif for the New Wave, while René Clément’s New Wave pastiche Plein Soleil (1960) gave it an international profile, and later prompted D.K. Holm to give the sun-soaked noir genre a name: ‘film soleil’. Later classics of the genres are Chabrol’s Les Biches (1968) and Deray’s La Piscine (1969). That Pierrot le fou was seen by Godard as the narrative continuation of his noirish Bande à part (1964), shot in black and white, illustrates neatly the film’s ‘soleil-ish’ credentials. The plot, of course, is pure noir: a good man led astray for love of a bad woman, but the simplicity of this tragic love story is made complicated in Pierrot by two key devices. Firstly, the shared voice-over, though borrowed from Alexandre Astruc’s costume melodrama Une vie (1958), is a doubling up and undermining of traditional American noir voice-over. When we end up with these two voices reciting poetry, post mortem, the memory of Mizoguchi’s ghost lovers (see Yôkihi, 1955) takes us even further from American film noir. 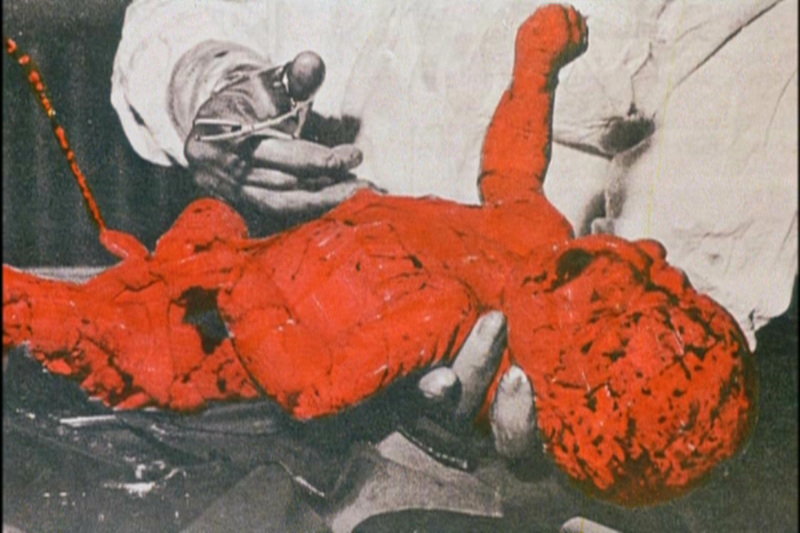 The second disruptive device is artifice: when someone is killed, the blood we see is just red paint. Though we might accept that it couldn’t be real blood – as we know that a corpse with a pair of scissors in his neck cannot really have been stabbed – when at the end of the film Belmondo takes the brushes in hand to paint his face blue, becoming eventually a red and yellow abstract composition, we have been ourselves abstracted from the banality of the story, and pushed towards an appreciation of form. With multiple inserts of still images, rapid fire flashbacks and discontinuous edits, the form of Pierrot le fou seems to be characterised by Alain Resnais-style montage. However, an ASL of 21.3 seconds (more than twice that of A bout de souffle) suggests a more Bazinian aesthetic, based on the shot sequence. In fact, the collagist aesthetic of Pierrot allows it to be both, alternating passages of contrastive cutting with long takes where the action plays out in full, like the scene where Ferdinand waits on the tracks for an approaching train, and the drama is presented in a single ninety-second shot. It was Louis Aragon, in his hymn of praise to Godard’s film, ‘What Is Art, Jean-Luc Godard?’, who identified collage as the aesthetic principle of Pierrot le fou. 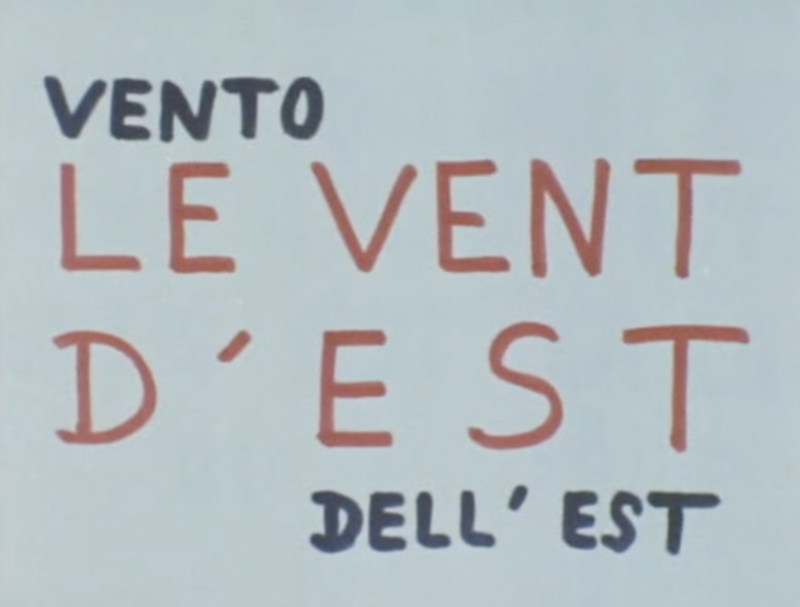 It informs the many digressions that interrupt the plot (Godard had in his short film Une histoire d’eau praised Aragon’s own discourse on the art of digression), even down to the closing coda, and it sanctions every contrastive insert of a cartoon image or Picasso painting. Ferdinand’s diary, a collage of narrative, original speculations and borrowed quotations, is an image of the film as a whole, a larger scale collage incorporating literature, philosophy, cinema and painting, alongside cars, clothes, and landscapes, all fragments of the real world fixed on this canvas. Everyone of Godard’s eight films with Anna Karina could be seen as a love poem from director to star. This a familiar pattern, one set by the films of Renoir with Catherine Hessling, of Orson Welles with Rita Hayworth, of Rossellini with Ingrid Bergman, or of Nicholas Ray with Gloria Grahame. But none of those films is autobiographical, and nor are Godard’s. The temptation to read the tragic love story of Jean-Luc and Anna into the tragic love story of Ferdinand and Marianne is a strong one, but it should be strongly resisted. Whatever raw material might have come to the film from real life came via the stories of cinema, where love ends in death, necessarily. Paradoxically, despite multiple deaths and mournful remembrance, Pierrot le fou is a life-affirming film, in its celebration of landscape, of art and of beauty. 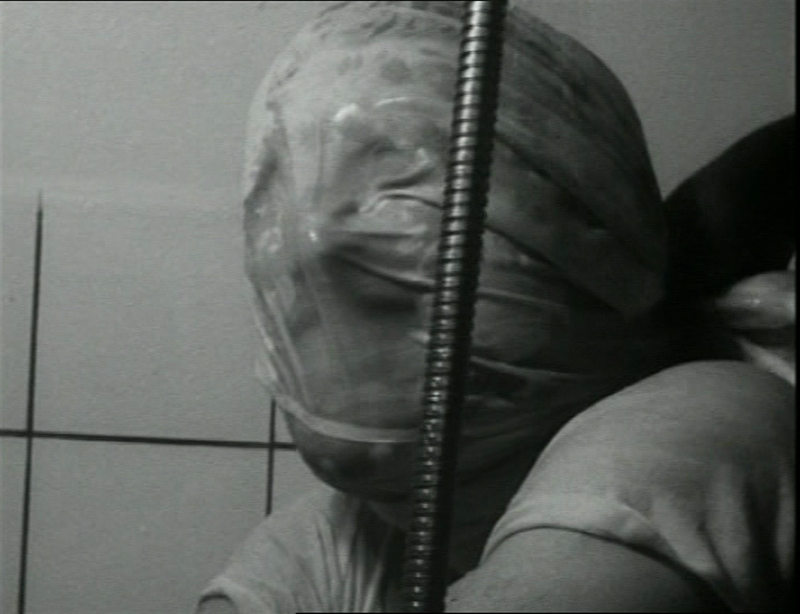 If there is anything autobiographical to retain from Pierrot, it is not the anecdotes about Godard’s jealousy of Karina. These have been told of every Godard-Karina film since Le Petit Soldat, and even of those from that period without Karina (see Le Mépris and Une femme marieé), and they have contributed nothing to our understanding of those films as works of art. Something autobiographical might just be found in the film’s affirmation, quoting Rimbaud, that ‘true life is elsewhere’, somewhere outside of cinema. No one real in the film died, and Jean-Luc and Anna went on to make another two films together. When a neon sign reading ‘RIVIERA’ is framed to isolate the middle three letters, ‘VIE’, meaning ‘life’, this value of the film has become a sign to be manipulated. The same thing happens to death, which is everywhere in Pierrot, but always in the stylised expression given it by the cinema, or else by literature, or art. The last entry in Ferdinand’s diary shows the letters ‘la’ and ‘rt’, which should spell ‘l’art’, but there is a gap between them in which the pen inserts the letters ‘mo’, transforming ‘art’ into ‘la mort’, death. At this point, then, this is the artifice of art, the art of playing with signs, of making meaning from them. We are back to the end of the opening title sequence, when PIERROT LE FOU became a simple O. The closing titles return to the lettering of the opening, but forego play in favour of simple, classical arrangements of the credits in centred blocks, all blue, with no letters appearing or disappearing. The music, after the complex stylistic shifts of Antoine Duhamel’s multi-themed score, returns to something simple, Schumann on the piano. A restoration of order, and an affirmation of art. I have already mentioned Louis Aragon’s powerful defence of Pierrot le fou, when lesser men had condemned the film as self-indulgent, incomprehensible, elitist and cold. Aragon’s essay was called ‘What Is Art’, mimicking Ferdinand’s question ‘What is cinema?’. Aragon straightway answers his question: ‘There is one thing of which I am certain… That the art of today is Jean-Luc Godard.’ Pierrot le fou is very pop, very fashion, very sixties. But it is also one of the great works of cinematic modernism, a turning point in cinema style, and a very beautiful film. There are other connections between the two films. 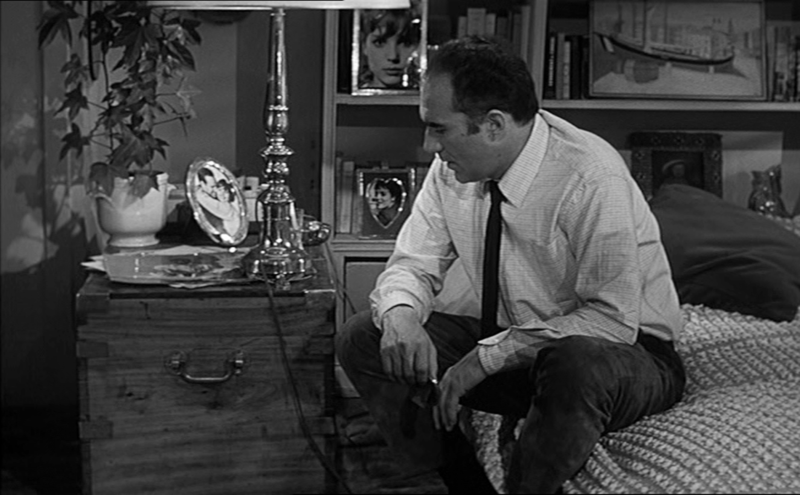 Anna Karina appears in De l'amour, and Michel Piccoli, above, was one early suggestion for the Ferdinand role in Pierrot le fou.